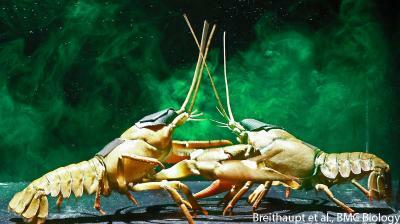 Walking through urine drives crayfish into an aggressive sexual frenzy. Researchers writing in the open access journal BMC Biology suggest that a urine-mediated combination of aggressive and reproductive behaviour ensures that only the strongest males get to mate. Fiona Berry and Thomas Breithaupt from the University of Hull, UK, investigated the effects of urine-based chemical signaling on sexually active crayfish. Breithaupt said, "Our results confirm that females initiate courtship behavior; males will only attempt to mate if they receive urinary signals from the female. Females, however, send a mixed message by releasing an aphrodisiac while also acting very aggressively towards the males". Females could profit in different ways from displaying such conflicting signals. By stimulating aggressive behaviour in males, females can gauge male size and strength and thereby ensure that only the fittest males get to fertilise their eggs. According to the researchers, "Timing seems to be key to this interaction as urine induces aggression in both sexes. Males will discontinue urine release early in the sexual encounter, which may mitigate the female's antagonism and enhance mating success".